Over 100 students from Western Illinois University take part in Student Advocacy Day in Springfield, Illinois to lobby legislatures to fund higher education and MAP Grant funding for public colleges and universities. SPRINGFIELD, Ill. — College students from all around the state of Illinois met in Springfield, Illinois at the Capitol Building during the floor sessions of the Illinois Senate and House of Representatives on Oct. 20 for Student Advocacy Day to lobby for Monetary Award Program (MAP) Grant funding after going four months into a fiscal year without a budget. 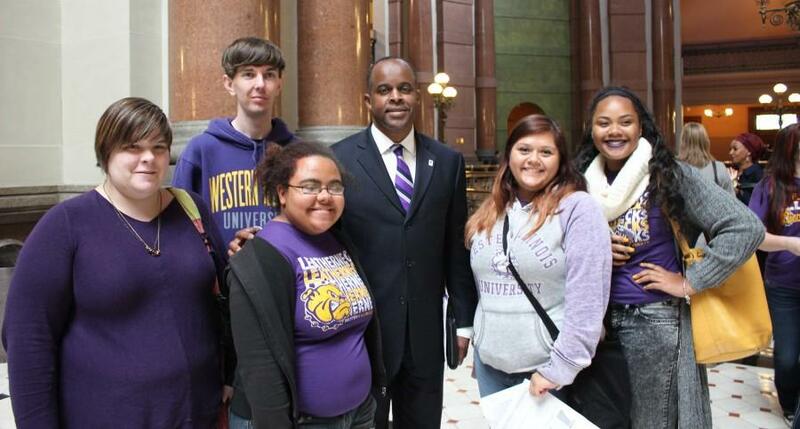 Urbana-Champaign, organized Student Advocacy Day. “Right now, the state is failing over 130,000 students at all of our public institutions and universities,” Dickey said. “The fact that this is the first time that all of our universities are having to look at seriously dramatic cuts to operations, if not catastrophic cuts to their operations, because they don’t know what’s going to happen when tuition money runs out. Dickey stressed that in order to be a successful state, MAP Grant funding is needed. Wil Gradle, president of Student Government Association (SGA) at Western Illinois University, was the contact on campus for getting the event known to students. Students signed up for the event in advance to be placed into groups according to who their state representatives were. They were then given briefings by a student leader about the representative and were told how to have the representative pulled from the floor. After getting the representatives from the floor, the students would then advocate for MAP Grant funding. “This is the first time in the 160-year history of higher education in the state of Illinois that this has happened to us,” Dickey said. After the Republican caucus, State Representative of the 93rd District Norine Hammond said the funding of higher education was a majority of the conversation. “We met with the governor for about an hour and a half, and much of the discussion revolved around higher education,” Hammond said. “MAP Grant funding and how we move this forward because the students, they’re our future. So that’s where our focus is today. Jack Thomas, president of Western, also made an appearance at the capitol for a meeting between public university presidents, chancellors and select legislators. “We’re trying to make sure that we get our funding and the MAP funding, so we’ve been meeting with various legislators to make sure that they hear us and that they understand the significance of this budget impasse and how it is affecting our universities and particularly our students and the education that we provide,” Thomas said. Thomas also said he was pleased with the amount of Western students advocating for funding. Over 15 colleges and universities were represented at the event, including Western, Eastern Illinois University, Illinois Central College, University of Illinois, Governors State University, Southern Illinois University as well as others.